I met Franz Stigler by Blitz, Canada. 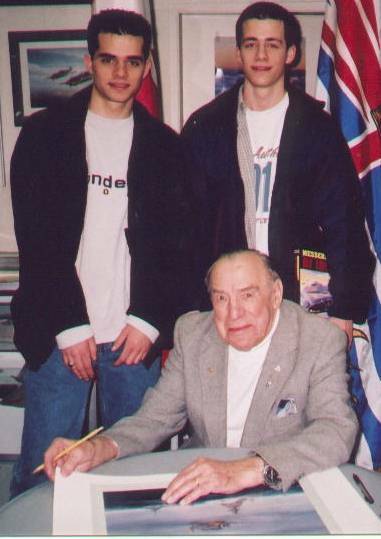 Blitz had the honor to meet the famous German ace Franz Stigler in January 2001. He wrote report of the meeting and the various answers by the pilot. Mr. Stigler is well known and respected from an unusual act of war - he refused to shoot down a heavily damaged B-17 bomber, and escorted it towards home. This act of chivalry was a mystery for a long time, until in 1990 it was found out that Stigler was the german pilot in question - and he was brought to meet the B-17 crew, securing suddenly a place amongst the fighter pilot legends. Well I gotta say I was a complete BLAST meeting Franz. It was a perfect setting. Informal small local retail store with at most only about 7 people there. In other words I spent about 1 hour 1/2 just talking to him. Drilling him with questions and being in general just awinspired that I was actually talking to a ME109 ACE with 28 kills 5 four mots and a guy with plenty of stick time in the first operational jet the ME262. He's a great guy to just talk to (which he did willingly). Below are the questions that I fired at him and the summary (not direct quotes since I didn't record anything) of what he responded back to me. Its all anticdotal evidence but hey at least you can say its a primary source and straight from the "horses mouth" persay. Enjoy. What was your favorite 109? The F version was my favorite. It was not nearly as sluggish in the controls as the G version was. It was best suited as a Dogfighter. The G6 however was better at higher altitudes and had a higher ceiling than the F's. When you fired your guns, did u shoot them separately or together? The stick had 2 different buttons, one for the cannon and on for the machine gun. You flipped open a cover for the cannon before firing, and waited till the enemy was within 200ft, and within the 2 rings on the REVI Gun sight (letting the fighter drift through the center). Both guns were fired at the same time at that range. Are the stories true, that the 109 had weak wings and would loose them easily? He has never heard of a 109 loosing its wings from his experience or others. The wings could withstand 12 g's and since most pilots could only handle at most 9 g's there was never a problem. He was never worried about loosing a wing in any form of combat. Did most of the 109's have MW-50 or GM-1? Of all the 109G's he ever saw and flew, all had Water Methanol injection. This could be used in combat for up to about 2 min. any further use would have resulted in the engine being damaged and needing replacement upon landing. The F's did not have this boost system. It helped pilots in emergency situations in catching up to fighters or running away from them. Did you fly the 109 with the wing-mounted guns? Yes he had, but almost everyone he new got the guns removed (including himself). The 109 handled much worse at low speeds with the guns on the wings, but climb was similar. It only really added some weight to the a/c. What's the fastest you ever had a 109 in a dive? I've taken it to about 680 to 750 km/hr at which point you needed 2 hands to pulls it out of the dive. Did pilots like the slats on the wings of the 109? Did pilots like the tracers or did some not use them? Every third round was a tracer round and most pilots he new used them. However they were not used to aim. The tracer round always had less of an arc than the actual bullet. So if the pilot aimed using the tracers the bullets would all miss. A good pilot used the gun sight and always waited till they were at close range. What other types of planes did you fly? He flew the ME262 on many missions near the end of the war and likes its speed most of all. The engines had to be overhauled every 20 hours, and the a/c was sluggish in its controls at low and very high speeds. To many it was hard to switch to a new aircraft after flying only one type for so many years. The huge speed advantage made it difficult to do passes on bombers as they would always end up overshooting the formation since they came in too fast. It took some getting used too. On landing they were very vulnerable however and used 190's to cover them. The stick controls at low speeds was bad, and the engines had to be throttled very far back to prepare for landing. He also regularly flew the Ju87 to visit his girlfriend at night. It was very forgiving in its flight characteristics and had very good maneuverability. The 190 was over all a better a/c than the 109, but again the pilots liked the 109's climb and simply the fact that by the time they had flown 400 combat missions the 109 had become very very familiar to them. He also flew a 110, which he thought was sluggish and made for a large target for fighters. Franz also said he once flew a 4-engine flying boat. Fanz Stigler liked the 109G as well and also enjoyed flying the K-4. The K-4, he said was very much like the G yet could leave all other fighters behind in climb. In control feel he said the K felt identical to the G. He described on many occasions where they would just bank away from the fighters and climb away from them (my guess this is probably after attacking them? )He also flew a Spitfire once, saying that he liked the a/c. How did the cockpit feel in the 109? The cockpit was small, but one got used to it after a while. In the end it felt comfortable since you felt like part of the plane. The Spitfire's cockpit did not feel that much roomier to him either. The 262 cockpit however was larger in comparison. It also had a long flight stick, giving the pilot lots of leverage in flight. Were the guns on the bombers dangerous or worrisome to pilots? Yes and no (as he points to his head where u can see an indent). If you have 28 bombers with 10 guns each, all pointing and shooting at you they could be very dangerous. He has an indent in the upper part of his forehead from a .5 cal bullet that had smashed through the thick armored glass in his 109 cockpit. The bullet had lost enough speed by this time that it had only "stuck" into his head. He said he almost never returned home from a bomber attack without bullet holes somewhere on his aircraft. Stigler had to bail from his aircraft 6 times. The last time while it was on fire in the cockpit after he was "gang banged" by 4 Spitfires on his 6. He also ditched his a/c 11 times, once in the ocean due to damage or coolant leaks. Stigler ended the war with 28 confirmed kills, and or(?) 5 four engine bombers. Adolf Galland was his best friend and he flew along side him on many occasions. He also said that Marseille was a superb pilot and got kills using only 4 cannon rounds(he knew him while fighting in North Africa). Marseille was also a bit of a rebel and not real soldier material. Stigler spoke at the '00 WarBirds con and it was fantastic to hear his stories (parachutes acting as bedding). Then there's the time an Allied sub checked out his landed aircraft (must have been when he was in the flying boat). I don't remember if he was boarded or not, but it has to do with an infirmary/hospital, so maybe the boat had wounded on board and was let go. Anyone from the con remember? Also, very notable, though he's probably too much of a gentleman to mention it himself... Once when he was on his own he came upon a wounded B-17 that was struggling home. He saddled up behind it and saw that the tail gunner was dead... the bomber was limping home so he flew around it to check it out. It didn't fire on him. He tried to indicate to the B-17s pilot that he wanted him to settle the plane down in Germany, but the American would have none of that. Stigler then tried to point him towards Sweden, since he still had enough fuel in his fighter to stay with him for that length of time. The B-17 kept flying towards England, though, barely able to keep flying (it was the most badly damaged bomber Stigler had ever seen that was still aiborne) and totally defenseless. Stigler escorted him for a while, then finally waggled his wings and headed for home, never having fired upon the four engined bomber that was totally at his mercy. The B-17 limped home losing altitude all the way and made it to England at only 200 feet and landed with extreme difficulty right away. Charles Brown (the B-17 pilot) couldn't tell the story for years since it was classified as secret - during war time it wouldn't do well to talk about Germans who were decent human beings. Stigler never talked about it during the war or he would have been executed. Years later, they met up and have become fast friends. At the WarBirds con they both told the story from their own perspective and a couple of news stories were shown that had been filmed a few years back. I tell ya, there wasn't a dry eye in the house! There are plenty more stories, too. One time when he bailed in cloud cover, opened his chute and landed within seconds. He had no idea he was so close to the ground and landed on a mountain that he didn't even know was there! I think that's when he put the parachute to use with a Fraulein in the closest village. An amazing man, without a doubt. Not only for his incredible experiences as an aviator, but also for his humility (the contrast to Gabreski's booming voice -- who was also a guest speaker -- was remarkable) and a true act of benevolence. The episode involving the sub goes something like this. The British had shot down a flying boat that was carrying wounded men. The Germans protested this vigorously. One day as another flying boat was to leave with wounded the usual pilot for some reason was unavailable and Franz was pressed to make the flight. On the way across the Mediterranean Franz was suddenly bracketed by two Beaufighters! They signaled for him to land and of course, he did. After a bit while the fighters circled overhead a sub emerged and a small raft with British sailors and an officer paddled over to Franz's plane. He was boarded and inspected to insure his trip was indeed, transporting wounded. Satisfied the British returned to thier patrol and Franz continued on his way. Probably the only incident of it's kind during the war! Franz was shot down during the evacuation from Tunisia (wasn't this called the St. Valentine's day massacre?). He can embellish the story much better, but he ditched his 109 in the Med, and before he could get out of the plane, a wave swamped him and turned his plane upside down. By the time he freed himself and got the canopy off, he estimates he was about 50 feet underwater. He inflated his life vest and was popped to the surface like a cork. He managed to get into his life raft and was on the open sea for 2 to 3 days before he was rescued. During that time, a British sub surfaced nearby, and he had to make the decision as to whether to fire off his very pistol (and become a POW) or let the sub go and take his chances with a later rescue by his own comrades. He stowed the pistol (I sure as heck don't know if I would have!!!) and was subsequently rescued. He has lots of stories like this....amazing stuff. Brown's B-17 was perhaps the most heavily damaged bomber to return from combat. It survived because of an enemy's act of chivalry. Dec. 20, 1943, was a typically cold, overcast winter day in Britain as 2d Lt. Charles L. Brown's B-17F lined up for takeoff. It was 21-year-old Charlie Brown's first combat mission as an aircraft commander with the 379th Bomb Group, the target an FW-190 factory at Bremen, Germany. He and his crew of Ye Olde Pub were to become participants in an event probably unique at that time in the air war over Europe--a mission that would remain shrouded in mystery for many years. The bombers began their 10-minute bomb run at 27,300 feet, the temperature: negative 60 degrees. Flak was heavy and accurate. Before "bombs away," Brown's B-17 took hits that shattered the Plexiglas nose, knocked out the number two engine, damaged number four--which frequently had to be throttled back to prevent overspeeding--and caused undetermined damage to the controls. Coming off target, Lieutenant Brown was unable to stay with the formation and became a straggler. Almost immediately, the lone and limping B-17 came under a series of attacks from 12 to 15 Bf-109s and FW-190s that lasted for more than 10 minutes. The number three engine was hit and would produce only half power. Oxygen, hydraulic, and electrical systems were damaged, and the controls were only partially responsive. The bomber's 11 defensive guns were reduced by the extreme cold to only the two top turret guns and one forward-firing nose gun. The tailgunner was killed and all but one of the crew in the rear incapacitated by wounds or exposure to the frigid air. Lieutenant Brown took a bullet fragment in his right shoulder. Charlie Brown figured the only chance of surviving this pitifully unequal battle was to go on the offensive. Each time a wave of attackers approached, he turned into them, trying to disrupt their aim with his remaining firepower. The last thing oxygen-starved Brown remembers was reversing a steep turn, becoming inverted, and looking "up" at the ground. When he regained full consciousness, the B-17 was miraculously level at less than 1,000 feet. Still partially dazed, Lieutenant Brown began a slow climb with only one engine at full power. With three seriously injured aboard, he rejected bailing out or a crash landing. The alternative was a thin chance of reaching the UK. While nursing the battered bomber toward England, Brown looked out the right window and saw a Bf-109 flying on his wing. The pilot waved, then flew across the B-17's nose and motioned Brown to land in Germany, which the aircraft commander refused to do. After escorting them for several miles out over the North Sea, the Luftwaffe pilot saluted, rolled over, and disappeared. Why had he not shot them down? The answer did not emerge for many years. The B-17 did make it across 250 miles of storm-tossed North Sea and landed at Seething near the English coast, home of the 448th Bomb Group, which had not yet flown its first mission. The crew was debriefed on their mission, including the strange encounter with the Bf-109. For unknown reasons, the debriefing was classified "secret" and remained so for many years. Lieutenant Brown went on to complete a combat tour, finish college, accept a regular commission, and serve in the Office of Special Investigations, with the Joint Chiefs of Staff, and in other Air Force and State Department assignments until his retirement. He now lives in Miami, Fla., where he is founder and president of an energy and environmental research center. The image of his strange encounter with the Bf-109 remained firmly embedded in Charlie Brown's memory. In 1986, he began a search for the anonymous pilot. Finally, in 1990, former Oberleutnant Franz Stigler, now living in Canada, responded to a notice published in a newsletter for German fighter pilots. By comparing time, place, and aircraft markings, it was determined that Stigler was the chivalrous pilot who had allowed Brown's crew to live. Not surprisingly, Brown and Stigler have become close friends. On that December day in 1943, there had been two persuasive reasons why Stigler should have shot down the B-17. First, earlier in the day, he had downed two four-engine bombers and needed only one more that day to earn a Knight's Cross. Second, his decision to not finish off the aircraft was a court-martial offense in Nazi Germany and if revealed could have led to his execution. He considered these alternatives while flying formation with the B-17, "the most heavily damaged aircraft I ever saw that was still flying." He could see the wounded aboard and thought, "I cannot kill these half-dead people. It would be like shooting at a parachute." Franz Stigler's act of chivalry has been justly, though belatedly, honored by several military organizations here and abroad. On the other hand, Charles Brown was not decorated for his heroism over Germany, which never was reported by the 448th Bomb Group at Seething to his commanders. Such are the fortunes of war and its aftermath.